I’m going to keep it short today, but I’m getting sick of hearing about the Fed’s easy money. How is Fed policy easy, exactly? Let’s start with whether prices are rising too quickly, signalling an overheating economy. 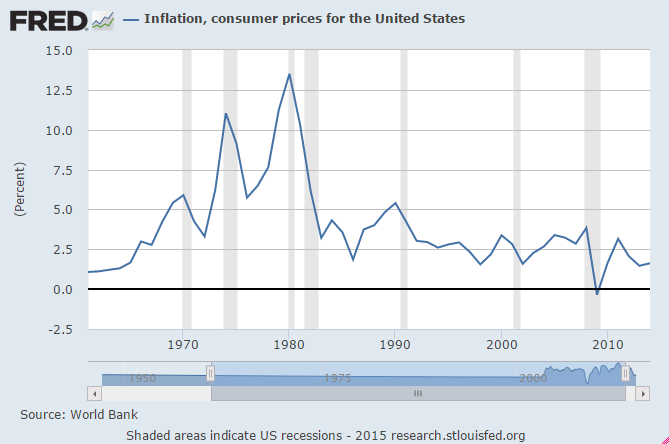 Below is inflation in consumer prices since the 1960’s. Aside from the 2008 panic, we’re experiencing the lowest inflation in over 40 years. So money doesn’t look “easy” here. What about future inflation? Yes, inflation is subdued today, but all that QE must be about to blow up in our faces. 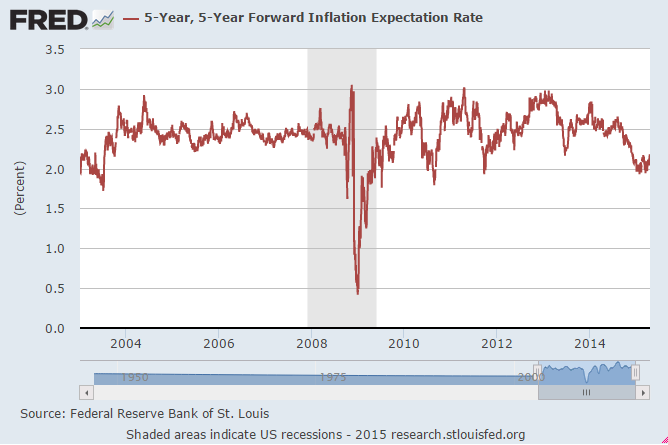 Well, below is 5-year forward inflation expectation rate. Again, this looks quite subdued, especially towards now. Maybe the economy is growing too quickly? That could surely cause imbalances. Well, from the below two graphs, we have NGDP overall in three distinct phases. Lots of growth (getting too fast) up to the 1970’s. 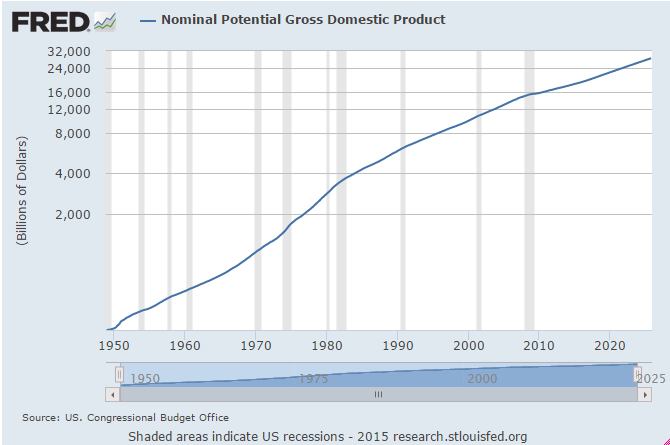 More ‘just right’ growth from the 1980’s until the 2008 panic, then slow growth from 2008 until now. Again, I don’t see where Fed policy could be called “easy”. If anything, Fed policy is quite tight. 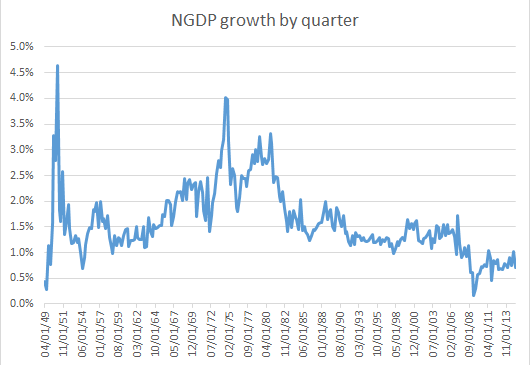 Just looking at the change in NGDP per year, we could hardly say conditions are close to boiling over. So why is almost every investment analyst and economic expert out there shouting about “loose” Fed policy inflating stock market and housing bubbles, when clearly policy has been quite tight since 2008? Well, I’ve ignored what many of you will think is the obvious answer: interest rates are low. But saying interest rates are low means Fed policy is loose is like saying my getting colder makes the sun go down. The setting sun is like our overall American macroeconomic indicators. My feeling warm is more like interest rates. The price of money (interest rates, yields, etc.) is the result of the confluence of supply and demand for credit, not the cause. In a more-slowly-growing economic, demand for credit will be slack. Therefore, low interest rates.